I got mine put together. I think it's funny that the gauge says "it" on the face. Is there any reason people are using a pressure relief valve rather than a pressure regulator such as this: http://www.amazon.com/Bostitch-BTFP7232 ... +regulator ? 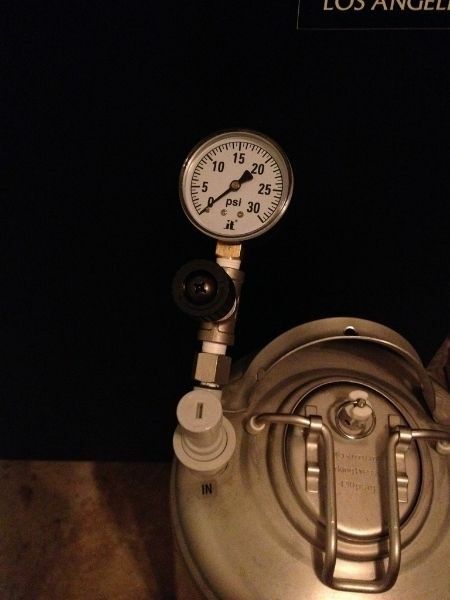 brewmeister13 wrote: Is there any reason people are using a pressure relief valve rather than a pressure regulator such as this: http://www.amazon.com/Bostitch-BTFP7232 ... +regulator ? That particular one seems fairly coarse in terms of pressure setting. You would probably want much finer control up to about 1 bar, and not need anything beyond 2 bar. Ideally, a stainless option would be nice, too. I vary mine depending of beer and style. Up to 30 psi for ales. Brew4Fun wrote: That particular one seems fairly coarse in terms of pressure setting. You would probably want much finer control up to about 1 bar, and not need anything beyond 2 bar. Ideally, a stainless option would be nice, too. Also, is stainless just incase krausen or beer makes it's way up to the regulator? In regards to stainless, it would give piece of mind I guess. Something that would not rust, and could be sanitized/cleaned in all of the agents we're already using without concern of leaching of anything. I have found these to be flaky and don't like them, nor the potential for gumming them up with blow-off. Once I get around to it, I'm going to check into the ones Weizenberg posted. I want to find the right tool for this job.